We arrived in Luang Prabang yesterday, after a magical two day slow boat ride featuring some of the most majestic scenery I have ever seen. 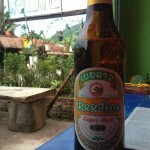 Luang Prabang is one of the prettiest places I have ever been. No wonder it i a UNISCO world heritage site. 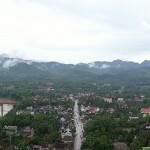 Loas is one of the poorest countries in Asia. During the Vietnamese War there were over 260 million bombs dropped here by the US. Today many unexploded bombs (UXO’s) remain in countryside areas which injure thousands of locals every year. 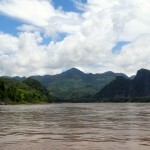 Most of the towns and villages in Laos are located near rivers and streams, whose tributaries eventually flow into the mighty Mekong. It is estimated that 80% of the population of Laos live near the water, as it provides a reliable life source for their main existence through subsistence farming. One of the fun things about arriving here by slow boat is seeing the other people on the boat around. The bars here close at about 10pm, leaving the local bowling alley the only place to hang out and get a beer. It feels like being a teenager again.